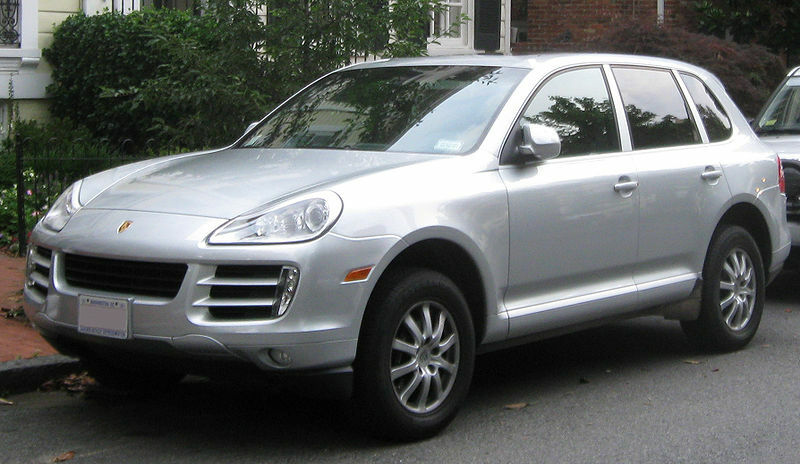 The Porsche Cayenne is a five seat mid-size luxury crossover manufactured by the German manufacturer Porsche since 2002, with North American sales beginning in 2003. Its platform was developed by Porsche and is shared with the Volkswagen Touareg and the Audi Q7. It is the first V8-engined vehicle built by Porsche since 1995, when the Porsche 928 was discontinued. 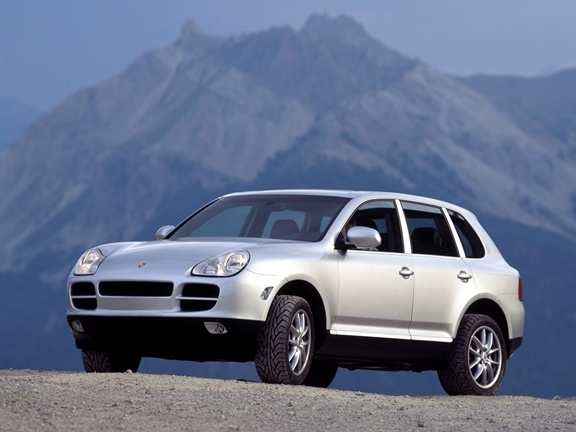 The Porsche Cayenne’s chassis type numbers are as follows: Type 955 (2002–2006), Type 957 (2007–2010), and Type 958 (2011+). The Porsche Cayenne’s frame and doors are sourced from Volkswagen, who uses the frames and doors for the Volkswagen Touareg model. 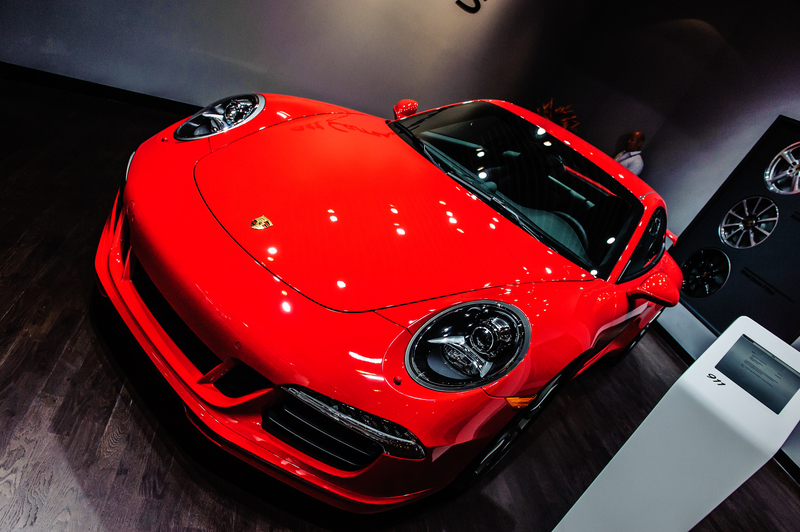 All other aspects of vehicle design, tuning, production are done in house at Porsche. The base model is powered by a 3.2-liter VR6 engine producing 250 hp (190 kW); modifications in the exhaust manifold allow power to peak at 6700 rpm. This is the same 3.2-liter motor found on a Volkswagen Touareg and Volkswagen R32. A Turbo Diesel engine is also available. Acceleration from 0 to 60 mph (97 km) is 7.5 seconds with manual transmission and 8.1 seconds with the Tiptronic S. Notably, independent testing has produced a time of 9.2 seconds for the Tiptronic diesel. The Porsche Cayenne S is powered by an 8-cylinder engine with a dry-sump lubrication system and variable valve timing. The Porsche Cayenne S’ engine produces 340 hp (250 kW) and 369 ft·lbf (500 N·m) of torque. Acceleration from 0–60 mph is 6.4 seconds and the top speed is 155 miles per hour. The Porsche Cayenne GTS is powered with a 405 hp 4.8 liter V8 and features a sport suspension and 21-inch (530 mm) wheels. It is lighter than the Porsche Cayenne S and has an aerodynamic body kit. The Porsche Cayenne GTS has a 0 to 60 mph (97 km/h) time of 5.7 seconds. A six-speed manual transmission is also offered. The 1st generation Porsche Cayenne Turbo had 450 horsepower (340 kW), and accelerated from 0 to 60 mph (97 km/h) in 5.3 seconds. A Porsche Cayenne Turbo S version was built in 2006 to compete with the Mercedes-Benz ML63 AMG. The Porsche Cayenne Turbo S included a low-range case, a locking differential, and the height-adjustable, off-road suspension also standard on the regular Turbo model. It was powered by a twin-turbocharged 4.5-liter V8 that produced 520 bhp (390 kW) and 700 N·m (520 lb·ft) of torque. Acceleration from 0–60 mph (96 km/h) was 5.0 seconds and the top speed was 171 miles per hour. It featured a 6-speed automatic Tiptronic transmission. A new Porsche Cayenne Turbo was revealed at the 2008 Beijing auto show. It received 50 hp (37 kW) more power, and now accelerated from 0–60 mph (96 km/h) in 4.9 seconds. Also revealed with the new Turbo was a new 550 horsepower (410 kW) Turbo S. Acceleration from 0–60 mph is 4.7 seconds and has optional ceramic composite brakes. Porsche is selling a diesel version of the Porsche Cayenne powered by Volkswagen’s 3.0L V6 TDI engine since February 2009. The engine is rated at 240 PS (180 kW; 240 hp) and 550 N·m (410 lb·ft) of torque. Originally a racing vehicle for Transsyberia rally, only 26 were built. The street version was later built to commemorate Porsche’s victory in Transsyberia rally. It is a variant with the 405 hp (302 kW) direct-inject 4.8L V8 from the Porsche Cayenne GTS. Sales began in January 2009. Porsche Cayenne GTS Porsche Design Edition 3 is a limited edition (1000 unit, 100 in USA) model based on Porsche Cayenne GTS designed by Porsche Design Studio. It includes Lava Grey Metallic body, 21-inch SportPlus wheels, black leather upholstery with red contrasting seams, Porsche Design Chronograph (Type P’6612). 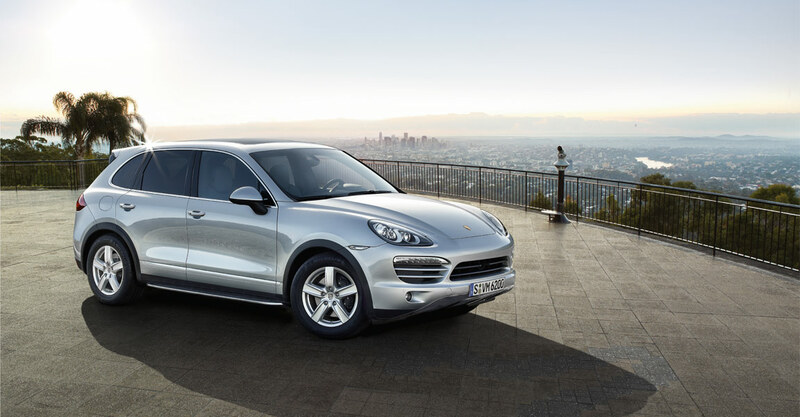 The Porsche Cayenne GTS Porsche Design Edition 3 sales began in May 2009 with MSRP of €79,100 before tax. At the IAA 2005, Porsche announced it will produce a hybrid version of the Porsche Cayenne before 2010 (Porsche Cayenne Hybrid). Two years later, at the IAA 2007, Porsche presented a functioning Cayenne Hybrid and demonstration model of the drivetrain. The 2011 Porsche Cayenne S Hybrid was launched in the U.S. market in November 2010. 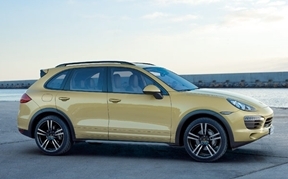 The new Porsche Cayenne is about 250 kilograms (550 lb) lighter than the previous model due to extensive use of aluminum and magnesium, making it more fuel efficient than the current lineup, as well as 5 centimeters shorter than the outgoing model. Despite its lower stance, the new vehicle’s off-road capabilities have been heightened without compromising the street performance-oriented layout and design. New Porsche Cayenne received a 3.6L V6 engine producing 300 hp (224 kW; 304 PS), the Porsche Cayenne S has the same 4.8L V8 in the Porsche Panamera S models producing 400 hp (298 kW; 406 PS) and the Porsche Cayenne Turbo received the Porsche Panamera Turbo’s 4.8L twin-turbo V8 producing 500 hp (373 kW; 507 PS). The long-awaited Porsche Cayenne S Hybrid using an Audi-sourced 3.0L V6 engine producing 333 hp (248 kW; 338 PS) and pair it with an lithium ion battery capable of 47 hp (35 kW; 48 PS) for a total of 380 hp (283 kW; 385 PS), just 20 hp (15 kW; 20 PS) shy of the Porsche Cayenne S. A manual gearbox served as the standard transmission system on the base Porsche Cayenne, with all other models featuring an eight-speed Tiptronic as standard equipment. The low-range transfer case found in the previous generation has been removed. The Porsche Cayenne’s interior has also been given a much-needed once over, and we’d be lying if we didn’t say that the Porsche Panamera appears to have had a lot of influence here, as well. Still, we like the overall layout and are glad that Porsche has fitted a better-looking (and, more than likely, better to use) steering wheel, though we’d have preferred column-mounted paddles to the +/- nubs fitted the the wheel. Still, we can’t wait to get our driving gloves wrapped around it.